This was our Christmas luncheon at Abuela's. Our lunch was provided by a secret Santa (maybe Helping Hands for Freedom)??? We had such a great time and lots of wonderful presents ! In 1982 a fearless and daunting woman by the name of Betty Kiser started a Gold Star Wives chapter in the Phoenix area. At one time the chapter grew to 250 members but currently stands at 163. 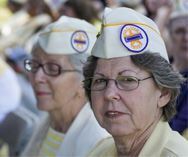 A big portion of our members are elderly ladies with connection to WWII. We also have widows from the Korean war, Vietnam war and OIF/OEF. Our chapter is quite active in the greater Phoenix area. Our members are active in all aspects of community service. Co-ordinate Snowball Express at Phoenix Sky Harbor Airport. Our Chapter holds meetings from September through June. Meetings are held on the first Saturday of each month with the exception of the December Christmas Luncheon and June luncheon for the installation of officers. The meetings are held at the location below.